Objective To evaluate the effectiveness of antenatal corticosteroids given at ≥34 weeks’ gestation. Data sources Electronic databases were searched from their inception to February 2016. 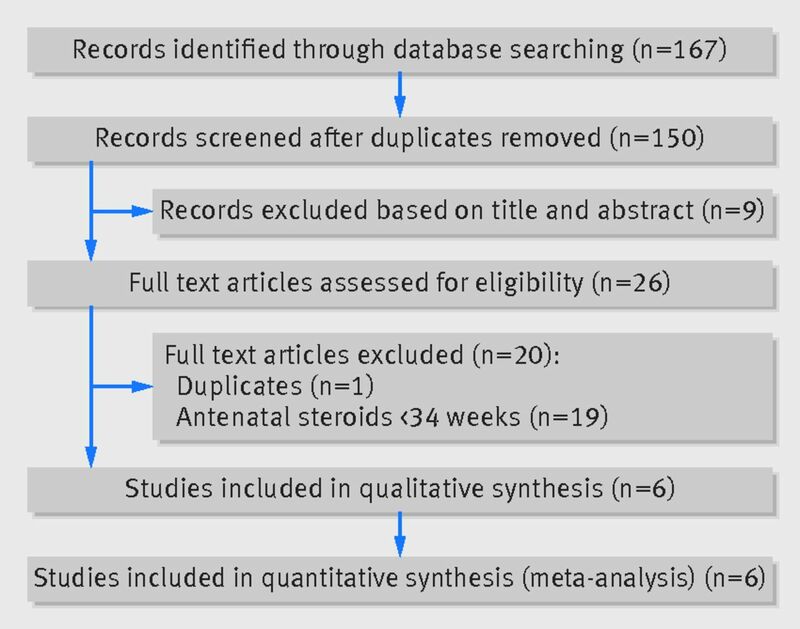 Eligibility criteria for study selection Randomized clinical trials comparing antenatal corticosteroids with placebo or no treatment in women with a singleton pregnancy at ≥34 weeks’ gestation. Trials on antenatal steroids in women expected to deliver late preterm (340-366 weeks) and trials given before planned cesarean delivery at term (≥37 weeks) were included. Data synthesis The primary outcome was the incidence of severe respiratory distress syndrome (RDS). The summary measures were reported as relative risks or mean differences with 95% confidence intervals. Results Six trials, including 5698 singleton pregnancies, were analyzed. Three included 3200 women at 340-366 weeks’ gestation and at risk of imminent premature delivery at the time of hospital admission. The three other trials included 2498 women undergoing planned cesarean delivery at ≥37 weeks. Overall, infants of mothers who received antenatal corticosteroids at ≥34 weeks had a significantly lower risk of RDS (relative risk 0.74, 95% confidence interval 0.61 to 0.91), mild RDS (0.67, 0.46 to 0.96), moderate RDS (0.39, 0.18 to 0.89), transient tachypnea of the newborn (0.56, 0.37 to 0.86), severe RDS (0.55, 0.33 to 0.91), use of surfactant, and mechanical ventilation, and a significantly lower time receiving oxygen (mean difference −2.06 hours, 95% confidence interval −2.17 to −1.95), lower maximum inspired oxygen concentration (−0.66%, −0.69% to −0.63%), shorter stay on a neonatal intensive care unit (−7.64 days, −7.65 to −7.64), and higher APGAR scores compared with controls. Infants of mothers who received antenatal betamethasone at 340-366 weeks’ gestation had a significantly lower incidence of transient tachypnea of the newborn (relative risk 0.72, 95% confidence interval 0.56 to 0.92), severe RDS (0.60, 0.33 to 0.94), and use of surfactant (0.61, 0.38 to 0.99). Infants of mothers undergoing planned cesarean delivery at ≥37 weeks’ gestation who received prophylactic antenatal corticosteroids 48 hours before delivery had a significantly lower risk of RDS (0.40, 0.27 to 0.59), mild RDS (0.43, 0.26 to 0.72), moderate RDS (0.40, 0.18 to 0.88), transient tachypnea of the newborn (0.38, 0.25 to 0.57), and mechanical ventilation (0.19, 0.08 to 0.43), and significantly less time receiving oxygen (mean difference −2.06 hours, 95% confidence interval −2.17 to −1.95), lower percentage of maximum inspired oxygen concentration (−0.66%, −0.69% to −0.63%), shorter stay in neonatal intensive care (−7.44 days, −7.44 to −7.43), and a higher APGAR score at one and at five minutes. Conclusions Antenatal steroids at ≥34 weeks’ gestation reduce neonatal respiratory morbidity. A single course of corticosteroids can be considered for women at risk of imminent late premature delivery 340-366 weeks’ gestation, as well as for women undergoing planned cesarean delivery at ≥37 weeks’ gestation. Systematic review registration PROSPERO CRD42016035234. In this systematic review and meta-analysis we evaluated the effectiveness of antenatal corticosteroids given at or after 34 weeks to reduce neonatal respiratory morbidity. This review was performed according to a protocol designed a priori and recommended for systematic reviews.6 We searched Medline, Scopus, ClinicalTrials.gov, Embase, Sciencedirect, the Cochrane Library at the CENTRAL Register of Controlled Trials, Scielo from their inception to February 2016. Search terms used were: “cesarean”, “caesarean”, “steroids”, “corticosteroids”, “planned”, “elective”, “term”, “preterm”, “infants”, “respiratory”, “morbidity”, “mortality”, “meta-analysis”, “metaanalysis”, “review”, “randomized”, “randomised”, “effectiveness”, “antenatal”, “disorders”, “late”, and “clinical trial”. No restrictions for language or geographic location were applied. In addition, we examined the reference lists of all identified articles to find studies not captured by electronic searches. Two authors (GS, VB) independently assessed the electronic search and the eligibility of the studies. Differences were discussed and consensus reached. We included all randomized controlled trials comparing use of antenatal corticosteroids (intervention group) with placebo or no treatment (control group) in women with a singleton pregnancy at 34 or more weeks. We also included trials on use of antenatal steroids in both women expected to deliver in late preterm (340-366 weeks) and women before planned cesarean delivery at term (≥37 weeks). Trials on prophylactic antenatal corticosteroids given at less than 34 weeks and those including multiple pregnancies and quasi-randomized trials (trials with allocation done on the basis of a pseudo-random sequence, such as odd or even hospital number or date of birth, alternation) were also excluded. Two authors (GS, VB) independently assessed inclusion criteria, risk of bias, and data extraction. Disagreements were resolved by discussion. We carried out all analyses using an intention to treat approach, evaluating women according to the treatment group to which they were randomly allocated in the original trials. Primary and secondary outcomes were defined before data extraction. The primary outcome was the incidence of severe RDS.7 Secondary outcomes were incidence of overall RDS (mild, moderate, or severe)7; incidence of mild and moderate RDS7; incidence of transient tachypnea of the newborn7; use of surfactant, mask ventilation, and mechanical ventilation; time receiving oxygen (hours); maximum inspired oxygen concentration (%); incidence of admission to neonatal intensive care unit; length of stay in the neonatal intensive care unit (days); APGAR score at one and at five minutes; neonatal hypoglycemia (glucose <2.2 mmol/L); and neonatal mortality (defined as death of a liveborn baby within the first 28 days of life). We separately assessed the primary and secondary outcomes in the main analysis as well as in studies on antenatal steroids in women expected to deliver late preterm (340-366 weeks) and in studies on antenatal steroids given immediately before scheduled cesarean delivery at 37 or more weeks. We also planned to assess the primary outcome (incidence of severe RDS) in sensitivity analysis according to the study design of the original trial, excluding studies without placebo as control. Two authors (GS, VB) independently completed the data analysis using Review Manager v. 5.3. They compared the completed analyses, and resolved any differences by discussion. Using custom-made data collection forms, we extracted data from each eligible study without modification of the original data. A 2×2 table was assessed for relative risk; for continuous outcomes means with or without standard deviations were extracted and imported into Review Manager v. 5.3. Potential publication biases were assessed graphically by using a funnel plot of the primary outcome and statistically by using Begg’s and Egger’s tests. We considered a P value of less than 0.05 to be significant. No patients were involved in setting the research question or the outcome measures, nor were they involved in developing plans for design, or implementation of the study. No patients were asked to advise on interpretation or writing up of results. There are no plans to disseminate the results of the research to study participants or the relevant patient community. Figure 1⇓ shows the flow of study identification. Supplementary file S1 details the full electronic search. Six trials, including 5698 singleton pregnancies, were identified as relevant and included in the meta-analysis.11 12 13 14 15 16 Data were also obtained by a follow-up of a randomized controlled trial.17 Publication bias could not be assessed for all the different outcomes, given the small (<10) number of studies included. Most of the included studies (four out of the six),13 15 were judged as low risk of bias in most of the seven Cochrane domains related to the risk of bias. All the included studies had low risk of bias in random sequence generation. Adequate methods for allocation of women were used in all the included trials, except two in which details on methods used to conceal allocation were not reported.13 16 In three double blind studies,12 14 16 neither the participants nor the investigators were aware of the treatment assignments. Three trials were judged as low risk of bias for incomplete outcome data,11 12 14 two as unclear,13 15 and one as high risk16 (figs 2⇓ and 3⇓). Supplementary file S2 shows the details of the risk of bias assessment for each included study. Table 1⇓ shows the characteristics of the included clinical trials. All six studies excluded multiple pregnancies. Four trials used betamethasone as corticosteroid11 12 14 15 and two used dexamethasone.13 16 Three trials used placebo as control.11 14 16 In all of the included studies but two,15 16 corticosteroids were given intramuscularly in two doses of 12 mg separated by 24 hours. The first trial used a single dose of 12 mg antenatal betamethasone.15 In the other trial, the intervention group consisted of 645 women who received intramuscular dexamethasone 8 mg every 12 hours for two days, 48 hours before planned cesarean delivery.16 None of the trials assessed compliance to the treatment. Table 2⇓ shows primary and secondary outcomes in the main analysis. Women who received prophylactic antenatal corticosteroids (betamethasone or dexamethasone) after 34 weeks had a significantly lower incidence of RDS (relative risk 0.74, 95% confidence interval 0.61 to 0.91; fig 4⇓), mild RDS (0.67, 0.46 to 0.96), moderate RDS (0.39, 0.18 to 0.89), transient tachypnea of the newborn (0.56, 0.37 to 0.86; fig 5⇓), severe RDS (0.55, 0.33 to 0.91; fig 6⇓), use of surfactant (0.61, 0.38 to 0.99), use of mechanical ventilation (0.52, 0.36 to 0.76), significantly lower time receiving oxygen (mean difference −2.06 hours, 95% confidence interval −2.17 to −1.95), lower maximum inspired oxygen concentration (−0.66%, −0.69 to −0.63), lower length of stay in the neonatal intensive care unit (−7.64 days, −7.65 to −7.64), higher APGAR score at one and at five minutes (0.06, 0.05 to 0.07), and higher neonatal hypoglycemia (1.61, 1.38 to 1.87) compared with those who did not. After converting results using the Hartung and Knapp approach, use of surfactant was no longer significant. No statistically significant differences were found in use of mask ventilation (relative risk 0.85, 95% confidence interval 0.69 to 1.04), admission to a neonatal intensive care unit (0.81, 0.54 to 1.20), and neonatal death (0.77, 0.21 to 2.83). Table 3⇓ shows the primary and secondary outcomes in women at risk of late premature delivery (340-366 weeks). Women who received antenatal betamethasone at 340-366 weeks’ gestation had a significantly lower incidence of transient tachypnea of the newborn (0.72, 0.56 to 0.92), severe RDS (0.60, 0.33 to 0.94), and use of surfactant (0.61, 0.38 to 0.99,) but higher neonatal hypoglycemia (1.61, 1.38 to 1.87). After converting results using the Hartung and Knapp approach, use of surfactant was no longer significant. No statistically significant differences were found in the incidence of overall RDS (0.98, 0.77 to 1.24), mild RDS (1.09, 0.66 to 1.80), mask ventilation (0.83, 0.67 to 1.02), mechanical ventilation (0.80, 0.51 to 1.24), admission to a neonatal intensive care unit (0.94, 0.87 to 1.02), APGAR score at one minute (mean difference −0.46, 95% confidence interval −0.78 to 0.14) and at five minutes (−0.62, −0.91 to 0.33), and neonatal death (relative risk 0.95, 95% confidence interval 0.20 to 4.58). This meta-analysis of the findings from six randomized controlled trials,11 12 13 14 15 16 including 5698 singleton pregnancies, evaluated the efficacy of prophylactic antenatal corticosteroids (betamethasone or dexamethasone) given at or after 34 weeks. Our findings showed that antenatal steroids administered at 34 or more weeks’ gestation reduce neonatal respiratory morbidity. Two current Cochrane reviews have reported data on the effects of antenatal corticosteroids.3 18 The first meta-analysis aimed to assess the effects on fetal and neonatal morbidity and mortality of administering corticosteroids to the mother before anticipated preterm delivery.3 The evidence from this meta-analysis supported the continued use of a single course of antenatal corticosteroids to accelerate fetal lung maturation in women at risk of preterm birth of less than 34 weeks’ gestation. However they did not evaluate the effectiveness of antenatal corticosteroids given at or after 34 weeks.3 The second meta-analysis,18 including only one trial (942 participants),13 showed that antenatal steroids did not prevent RDS compared with no treatment in women undergoing planned cesarean delivery at 37 or more weeks’ gestation. Our study has several strengths. The six trials included had a low risk of allocation bias by Cochrane Collaboration tool assessment. An intention to treat analysis was used. To our knowledge, no prior meta-analysis on this issue is as large, up to date, or comprehensive. A single course of antenatal corticosteroids should be considered routine for women at less than 34 weeks’ gestation for risk of preterm birth,3 whereas so far evidence for administering antenatal steroids at or after 34 weeks is still debatable. Our meta-analysis based on level 1 data showed that antenatal corticosteroids after 34 weeks’ gestation improved neonatal outcomes. The biological plausibility to explain our findings may be different in women undergoing scheduled cesarean delivery at term and in women at risk of late preterm delivery. Infants born at late preterm, between 34 and 36 weeks’ gestation, are more likely to experience respiratory complications than infants born at term.30 Our findings suggested that antenatal betamethasone in women at immediate risk of late preterm delivery (340-366 weeks) improves neonatal outcomes. Prophylactic antenatal corticosteroids given immediately before planned cesarean delivery at 37 or more weeks’ gestation are effective in reducing RDS. Therefore, in planned cesareans of infants at term, the risk of respiratory morbidity should be considered and the likely benefits of antenatal steroids compared with those of delaying delivery until 39 weeks’ gestation when possible. Delivery by scheduled cesarean delivery should be delayed until the 39th week whenever possible to reduce the risk of respiratory morbidity. When it is necessary to deliver by prelabor at 370-386 weeks’ gestation, parents can be counseled about the benefits of a single course of antenatal corticosteroids, such as a reduction in RDS from 6.7% (86/1281) to 2.7% (33/1217) (table 5⇑). Prophylactic betamethasone is also beneficial in decreasing neonatal respiratory morbidities (such as severe RDS, from 2.3% (35/1530) to 1.4% (22/1570) (table 3⇑)) in women at risk of imminent late premature delivery (340-366 weeks’ gestation). Tocolysis should not be used in order to delay delivery to allow for administration of late preterm antenatal corticosteroids, nor should an indicated late preterm delivery (such as for pre-eclampsia with severe features) be postponed for steroid administration. In conclusion, a single course of corticosteroids (either two 12 mg doses of betamethasone given intramuscularly 24 hours apart or four 6 mg doses of dexamethasone administered intramuscularly every 12 hours) should be considered for women undergoing planned cesarean at 37 or more weeks’ gestation as well as for women at risk of imminent late premature delivery at 340-366 weeks’ gestation. Contributors: VB conceived and designed the study. Both authors acquired, analysed, or interpreted the data; carried out the statistical analysis, provided administrative, technical, or material support, and cirtically revised the manuscript. VB supervised the study and is the guarantor. Funding: This study received no financial support. Competing interests: All authors have completed the ICMJE uniform disclosure form at http://www.icmje.org/coi_disclosure.pdf and declare: no support from any organization for the submitted work; no financial relationships with any organizations that might have an interest in the submitted work in the previous three years; no other relationships or activities that could appear to have influenced the submitted work. Transparency: The lead author (VB) affirms that the manuscript is an honest, accurate, and transparent account of the study being reported; that no important aspects of the study have been omitted; and that any discrepancies from the study as planned have been explained. Martin JA, Hamilton BE, Osterman MJ, Curtin SC, Matthews TJ. Births: final data for 2013. Natl Vital Stat Rep2015;64:1-65.pmid:25603115. Doyle LW. Victorian Infant Collaborative Study Group. Outcome at 5 years of age of children 23 to 27 weeks’ gestation: refining the prognosis. Pediatrics2001;108:134-41. doi:10.1542/peds.108.1.134 pmid:11433066. Roberts D, Dalziel S. Antenatal corticosteroids for accelerating fetal lung maturation for women at risk of preterm birth. Cochrane Database Syst Rev2006;19:CD004454.pmid:16856047. Royal College of Obstetricians and Gynaecologists (RCOG). Antenatal corticosteroids to prevent respiratory distress syndrome. Clinical Green Top Guidelines.Royal College of Obstetricians and Gynaecologists, 2004. Committee Opinion No. 677. ACOG committee opinion: antenatal corticosteroids therapy for fetal maturation. Obstet Gynecol2016;128:e187-94. doi:10.1097/AOG.0000000000001715 pmid:27661658. Higgins JPT, Green S, eds. Cochrane handbook for systematic reviews of interventions, version 5.1.0 (update March 2011). The Cochrane Collaboration, 2011. Available at: www.cochrane-handbook.org. (Accessed November 20, 2015). Report of working group of the British Association of Perinatal Medicine and Neonatal Nurses Association on categories of babies requiring neonatal care. Arch Dis Child1992;67:868-9. doi:10.1136/adc.67.7_Spec_No.868 pmid:1519991. Moher D, Liberati A, Tetzlaff J, Altman DG. PRISMA Group. Preferred reporting items for systematic reviews and meta-analyses: the PRISMA statement. J Clin Epidemiol2009;62:1006-12. doi:10.1016/j.jclinepi.2009.06.005 pmid:19631508. Shamseer L, Moher D, Clarke M, et al. PRISMA-P Group. Preferred reporting items for systematic review and meta-analysis protocols (PRISMA-P) 2015: elaboration and explanation. BMJ2015;349:g7647. doi:10.1136/bmj.g7647 pmid:25555855. Stutchfield P, Whitaker R, Russell I. Antenatal betamethasone and incidence of neonatal respiratory distress after elective caesarean section: pragmatic randomised trial. BMJ2005;331:662-8. doi:10.1136/bmj.38547.416493.06 pmid:16115831. Porto AM, Coutinho IC, Correia JB, Amorim MM. Effectiveness of antenatal corticosteroids in reducing respiratory disorders in late preterm infants: randomised clinical trial. BMJ2011;342:d1696. doi:10.1136/bmj.d1696 pmid:21487057. Ahmed MR, Sayed Ahmed WA, Mohammed TY. Antenatal steroids at 37 weeks, does it reduce neonatal respiratory morbidity? A randomized trial. J Matern Fetal Neonatal Med2015;28:1486-90. doi:10.3109/14767058.2014.958461 pmid:25163489. Gyamfi-Bannerman C, Thom EA, Blackwell SC, et al. NICHD Maternal–Fetal Medicine Units Network. Antenatal betamethasone for women at risk for late preterm delivery. N Engl J Med2016;374:1311-20. doi:10.1056/NEJMoa1516783 pmid:26842679. Balci O, Ozdemir S, Mahmoud AS, Acar A, Colakoglu MC. The effect of antenatal steroids on fetal lung maturation between the 34th and 36th week of pregnancy. Gynecol Obstet Invest2010;70:95-9. doi:10.1159/000295898 pmid:20234136. Nada AM, Shafeek MM, El Maraghy MA, Nageeb AH, Salah El Din AS, Awad MH. Antenatal corticosteroid administration before elective caesarean section at term to prevent neonatal respiratory morbidity: a randomized controlled trial. Eur J Obstet Gynecol Reprod Biol2016;199:88-91. doi:10.1016/j.ejogrb.2016.01.026 pmid:26905469. Stutchfield PR, Whitaker R, Gliddon AE, Hobson L, Kotecha S, Doull IJ. Behavioural, educational and respiratory outcomes of antenatal betamethasone for term caesarean section (ASTECS trial). Arch Dis Child Fetal Neonatal Ed2013;98:F195-200. doi:10.1136/archdischild-2012-303157 pmid:23424017. Sotiriadis A, Makrydimas G, Papatheodorou S, Ioannidis JP. Corticosteroids for preventing neonatal respiratory morbidity after elective caesarean section at term. Cochrane Database Syst Rev2009;4:CD006614.pmid:19821379. Brownfoot FC, Gagliardi DI, Bain E, Middleton P, Crowther CA. Different corticosteroids and regimens for accelerating fetal lung maturation for women at risk of preterm birth. Cochrane Database Syst Rev2013;8:CD006764.pmid:23990333. Prefumo F, Ferrazzi E, Di Tommaso M, et al. Neonatal morbidity after cesarean section before labor at 34(+0) to 38(+6) weeks: a cohort study. J Matern Fetal Neonatal Med2016;29:1334-8. doi:10.3109/14767058.2015.1047758 pmid:26037729. Zanardo V, Simbi AK, Franzoi M, Soldà G, Salvadori A, Trevisanuto D. Neonatal respiratory morbidity risk and mode of delivery at term: influence of timing of elective caesarean delivery. Acta Paediatr2004;93:643-7. doi:10.1111/j.1651-2227.2004.tb02990.x pmid:15174788. Berger PJ, Smolich JJ, Ramsden CA, Walker AM. Effect of lung liquid volume on respiratory performance after caesarean delivery in the lamb. J Physiol1996;492:905-12. doi:10.1113/jphysiol.1996.sp021356 pmid:8735000. Irestedt L, Lagercrantz H, Belfrage P. Causes and consequences of maternal and fetal sympathoadrenal activation during parturition. Acta Obstet Gynecol Scand Suppl1984;118:111-5. doi:10.3109/00016348409157136 pmid:6587720. Riley CA, Boozer K, King TL. Antenatal corticosteroids at the beginning of the 21st century. J Midwifery Womens Health2011;56:591-7. doi:10.1111/j.1542-2011.2011.00119.x pmid:22060219. Jain L, Eaton DC. Physiology of fetal lung fluid clearance and the effect of labor. Semin Perinatol2006;30:34-43. doi:10.1053/j.semperi.2006.01.006 pmid:16549212. Bloomfield T. Caesarean section, NICE Guidelines and management of labour. J Obstet Gynaecol2004;24:485-90. doi:10.1080/0144361042331271052 pmid:15369924. American College of Obstetricians and Gynecologists. ACOG committee opinion no. 561: Nonmedically indicated early-term deliveries. Obstet Gynecol2013;121:911-5. doi:10.1097/01.AOG.0000428649.57622.a7 pmid:23635710. Berghella V, Blackwell SC, Ramin SM, Sibai BM, Saade GR. Use and misuse of the term “elective” in obstetrics. Obstet Gynecol2011;117:372-6. doi:10.1097/AOG.0b013e31820780ff pmid:21252752. Warshak CR, Ramos GA, Eskander R, et al. Effect of predelivery diagnosis in 99 consecutive cases of placenta accreta. Obstet Gynecol2010;115:65-9. doi:10.1097/AOG.0b013e3181c4f12a pmid:20027036. Ceriani Cernadas JM. [Late-preterm infants, a growing challenge in both the short and long term]. Arch Argent Pediatr2015;113:482-4.pmid:26593787. Duvanel CB, Fawer CL, Cotting J, Hohlfeld P, Matthieu JM. Long-term effects of neonatal hypoglycemia on brain growth and psychomotor development in small-for-gestational-age preterm infants. J Pediatr1999;134:492-8. doi:10.1016/S0022-3476(99)70209-X pmid:10190926.